USA Cycling put on a makeup event in November to replace the last two days of the original National Masters track champs that were rained out earlier in the Season. This was held at the Colorado Springs track under the new winter dome. This is one fast track!Day one was record attempts, both Brian Moore and MaryBeth Pierantoni were within a 10th of a second of their age group flying 200’s, Brian with a 11.022 in the 55-59 and MaryBeth with 12.847 in the 50-54. Considering the temp was less than 60f both these athletes are keen to have another go at the records in the summer with better conditions. Mark Andersen, Kenneth Lo and Coach Povey all lowered their PR’s with Lee and Ken breaking 11s for the first time in a flying 200 and Kirk Robinson also lowered his PR by 3th’s to the new mark of 11.290 in the 45-49 group. Day three was the big one for us with it being the team events. 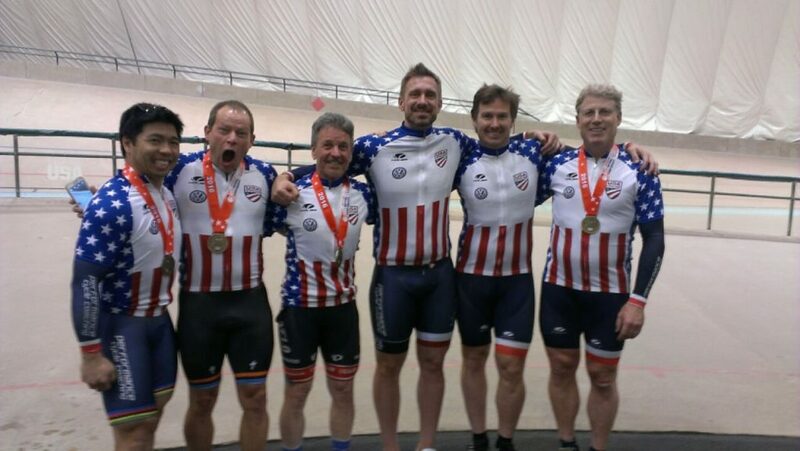 The day got off to a cracking start with both our 45+ team pursuit of Daryl Hemenway, Rick Morgan, Andrew Nevitt and John Schiefer and our 55+ team pursuit of Kirk Bickel, Dave Maminski, Stan Terusaki and Bill Brissman picking up Silver medals. 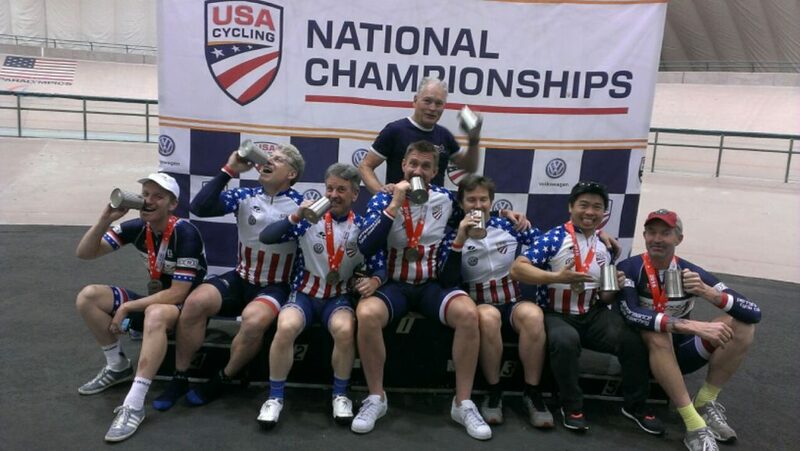 Then our first National Champions of the weekend were crowned with the “Brexit sandwich” team of Ken Lo, Mark Andersen and Coach Povey taking the 35-44 Team sprint and the “Triplets of Hellyer” Ray Gildea, Brian Moore and Dennis Pedersen taking the 55-64 group win. With silver medals for Kirk Robinson, Mark Rodamaker and Bronzes for Kirk Bickel and Bill Brissman it was a pretty dominate display by the PCC riders in the team sprint events. The day was rounded off nicely by Daryl Hemenway and Andrew Nevitt picking up a Bronze in a fast and furious 45+ Madison. Last but certainly not least was Team Performance Cycle Coaching finally being presented with the award for best overall team at the 2016 national Masters track championship, something we are all very proud of and already working hard to retain in 2017.